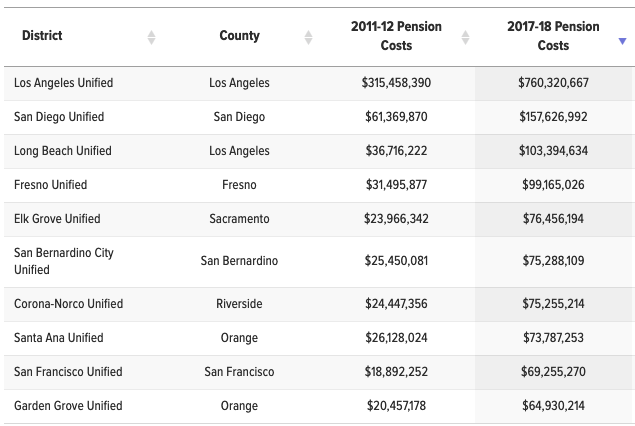 California school districts have seen their per student pension costs double to an average of $1,020 since the Legislature passed a 2012 law to rescue the state’s two pension systems. A year later, districts were ordered to make higher payments for seven straight years to CalSTRS, the pension fund for teachers and administrators. The per student contributions have increased an average of nearly $514 between 2013-14 and 2017-18, the most recent data available. Most payments have gone to CalSTRS, with a smaller proportion to CalPERS, which covers employees like secretaries and custodians. The increase was needed to cover pension funds’ unfunded liability, not to increase employees’ benefits. The per student analysis is based on ADA or average daily attendance. The chart does not include charter schools' contributions to CalSTRS and CalPERS. The state also contributes to CalSTRS, as do teachers and administrators.